Burj Al Arab - one of the world's most luxurious hotels and the highest tower in the world situated in the city of dreams Dubai. 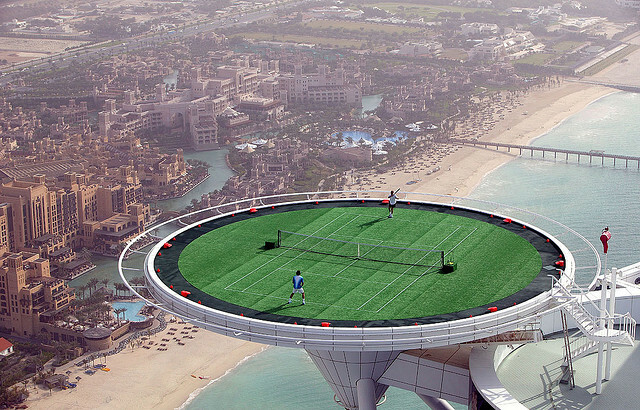 It has the highest tennis court in the world. Its space, located at 210 metres of altitude can also used as a helipad for emergency landings or guest traffic. This hotel become a dream hotel due to its extraordinary luxuries. To play and have complete control over the ball is quite difficult at the hight of 210 meter . 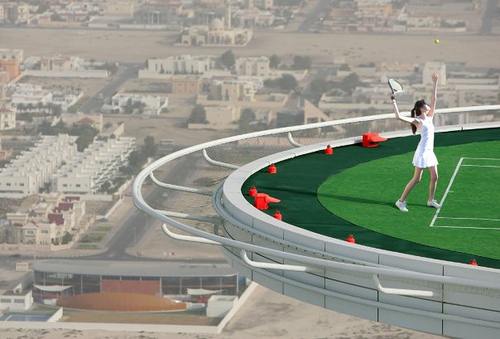 The scenic beauty of entire Dubai is visible from this ground and the view is breathtaking. Access to his hotel is limited for celebrities only because of its stying cost.